A decent musical where the songs are great, but the story and characters are routine and simple. This movie is okay at best. The songs are fun, sure, but the story and characters are both pretty dopey. Tom Cruise is the highlight of the film and you can tell that just from the trailers, as he plays crazy rock star Stacie Jacks. However, he is not the star of the movie by any means, and the characters who are tend to be pretty dumb and annoying. The movie is really about a young couple that is on again, off again, and then the nightclub where the two of them work. Even when both of them are not working there anymore, we stay with the owners of the nightclub and follow their storyline, and how they are dealing with a corrupt promoter. The best thing about this movie is the way it combines two songs at once, on a number of occasions, and ends up doing a pretty nice job. You can tell why this material might be worthwhile to see on the stage (the movie is based on a popular Broadway show), with all of it’s great musical numbers, but as a film, the story needed to be stronger and the characters needed to be more interesting and original. 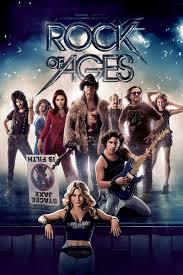 Rock Of Ages is not very good. In fact, the movie is kind of a mess that manages to be watchable only for it is music. The story itself is very lame and very clichéd. In addition, the movie knows it. Maybe that is because it is based on a Broadway musical where people come to see the music more than the plot. I am sure that works just fine on the stage with amazing set pieces and ear shattering songs, but as a movie, it just does not cut it. The music is great, sure, but what about the rest of the movie? The idea to this film is that it’s the eighties and hard-core rock is in. groups like Bon Jovi and Def Leopard are what everyone is talking about. So what does the movie do? It brings in a country girl, fresh off a bus, which is a complete fish out of water. We have seen that so many times before, even in movies that do it in pretty much this exact same way, such as coyote ugly. The hot young girl arrives in the city, is quickly taken advantage of, and then somehow gets a job working at the most popular bar / club. In rock of ages, that girl is Sherri, played by Julianne Hough. This movie has a ton of celebrities in it, and yet the real stars of the film are relative unknowns. Hough is one of them, and her counterpart is drew, played by Diego Bonita (whose biggest movie before this was mean girls 2.) Hough is not really any more known, having only been in the remake of footloose. In addition, these are the two actors the movie found for its leads? The other roles might be clichéd and dopey, but at least they are played by recognizable celebrities. There are the club owners, Alec Baldwin and Russell brand. 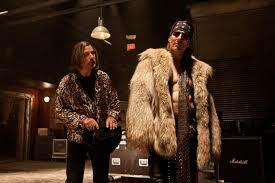 Then there is the major rock star, Stacee Jax (played by tom cruise.) there is also Jax’s agent, Paul, played by Paul Giamatti, and then there is the leading protestor against the whole rock movement. That is Patricia Whitmore, played by Catherine zeta Jones. A famous actor plays even her husband. Breaking Bed’s Bryan Cranston gets that thankless role. In addition, not a single one of these roles has any meat on it. Instead of one story, this movie goes for three. That is because all three of them are pretty dumb and nowhere near big enough to fill a whole movie. The first story is about Sherri. The second one is about drawn. Then the third one is about the club owners and the club. All three stories have the characters in hot water for most of the movie. All three stories feature the same side characters popping up as either villains or saviors in the most clichéd of ways. The Sherri and drew story is about their romance and how things are going great for them until one night while drew is performing. He thinks he sees Sherri do something, but never really asks her about it. Instead, he assumes what he thinks he saw is what really happened and the two of them go their separate ways. Now we get two different stories about each of them on their own. It does not get any better. The club story is a little bit more creative, but not by much. Dennis (Alec Baldwin) is the club owner. Lonny (Russell Brand) is his sort of in house manager. Lonny does all the legwork on the floor while Dennis watches from his office up above. In addition, Paul, the Stacee Jax agent, is screwing both of them. Jax comes and does a show and Paul takes most of the profit for himself. The show was supposed to be huge for the club and it rakes in a lot of money at a time when the club needed it badly, but Paul let us Dennis know that most of that money is going over to Jax. Of course Jax does not know any of this. There can only be one villain in a movie as simple as this, and Paul has got that role. The music is what really makes this movie. It is the best thing about the film by far and away. There are so many great songs on hand here, including a bunch from journey. The movie has fun with all of them, and sometime it is a little too much fun. Those are the times when characters sing when they should be talking. Luckily, the movie never really crosses into les miss territory, where all the dialogue is sung, but there are a couple of close calls. One is at the very start of the film when every person on a bus starts singing individual lines of a song, as if they are in a play. It comes off as pretty silly. Then another moment has character sitting in an office, on either side of a desk, singing. The good news is that more often than not, the music is handled pretty well. We don’t get any masterful choreography like in Chicago or anything, but what we do get are some pretty cool song combinations. The movie often cuts two songs together, alternating between characters in one scene belting out one song, mixed with characters in another scene singing another. So, for example, we get foreigner’s “Juke Box Hero,” mixed with Joan Jett’s “I Love Rock N Roll,” and then later we get, “We Built This City,” mixed with, “We’re Not Going To Take It.” the movie has the luxury of not having to play the songs in their entirety, but only using the chorus’ and that makes the combining of the songs much easier. Only one part of a song has to work with one part of another song. Rock Of Ages is okay at best. The music is fun, even though that could have also been a little better. Characters often open their mouths just a tiny bit when they are supposed to be singing, making it painfully obvious that they are not the ones hitting the notes at all. In addition, the story is clichéd and dumb, but at least it is watchable. Paul Giamati’s villain, for example, is pretty routine, but he is still played by Paul Giamatti, an actor who always brings something to the table. If this movie did not have it is all-star cast in supporting roles, it would not be worth the time. In particular, tom cruise, is what really gives this movie its star power. It is not a terrible film, but it is also not all that good.